The American Precision Museum is headquartered in a former armory that helped perfect the manufacture of interchangeable parts. Its collections showcase two centuries of American machining ingenuity. There may not be any single place that can properly claim to be the origin of the modern machine tool industry, but this place certainly merits top mention. At first glance, Windsor, Vermont, is not the kind of locale one would associate with advanced machining technology, nor with industry in any form. It is a picture perfect model for a quiet, old New England town; its most obvious attractions being the Cornish-Windsor Covered Bridge (the second longest in the U.S.) and the Old Constitution House, in the past a tavern where the Republic of Vermont, which lasted 14 years, was born in 1777. But Windsor is also home to an unusual institution—The American Precision Museum. 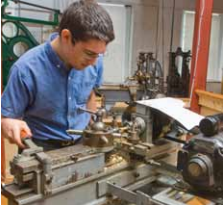 Intern Ben Holleran demonstrates a turret lathe made by Pratt and Whitney Co., Hartford, Conn.
Windsor, it turns out, is one of the key communities in an area long known as Precision Valley because it was home to a once vast machine tool industry. Dig a little deeper and you discover that the name of the town and its neighbors, Hartford and Springfield, were borrowed by early settlers who came up the Connecticut River Valley from communities with those same names in the Nutmeg State (Connecticut) and Massachusetts. According to Merritt Roe Smith, a historian of technology at MIT, it was in Windsor that the idea of manufacturing based on precision measurement, tooling, machinery and repeatable processes was pioneered. In Windsor, inventors and entrepreneurs took those ideas to an even higher state of development, launching the likes of Robbins & Lawrence, whose original armory building, complete with overhead shafts and belts and the remains of a waterwheel, now houses the museum. Nearby was Jones & Lamson Machine Tool, Bryant Chucking Grinder Company, Lovejoy Tool, Cone Automatic Machine Company (later known as Cone-Blanchard), and The Fellows Gear Shaper Company. In fact, so great was the concentration of important machine tool companies in the region, that the valley was reportedly ranked among the top 10 potential targets for enemy attack during World War II. During the Cold War the valley was a site for a massive nuclear civil defense evacuation exercise. But you would never know it today. The demise of machining in the region didn’t take a nuclear attack or enemy sabotage—just a combination of rapid technical change and shifting economic sands. Today, even the church at the center of Windsor boasts a forlorn sign on the front steps, begging anyone with money to donate funds to keep the ceiling from collapsing. Yes, admits Nancy Hoggson, development and communication manager at the American Precision Museum, the region’s economy has changed drastically and only a handful of machine tool or manufacturing companies remain in the area. 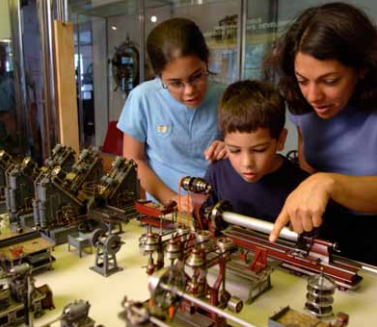 However, she notes, the museum’s deep connection to the machine tool industry persists—the River Valley Technical Center provides student interns for museum programs demonstrating both traditional machining and modern CNC techniques; the museum has developed a multimedia curriculum “kit” that helps schools in northern New England teach about industrialization and technology; and in September, museum staff traveled to the International Manufacturing Technology Show (IMTS) in Chicago to showcase the museum and the story of America’s brilliant start in manufacturing technology. 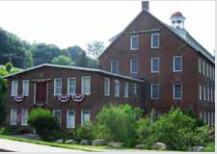 The American Precision Museum is in a quiet section of southeastern Vermont and attracts about 5,000 visitors annually. Due to high energy costs, the building is only open from late May through October, from 10-5 daily. ng over 200 years, right up to the introduction of CNC control. —twin granite beams supporting the bed, and broad, multistep wooden pulleys to power the spindle and chuck. The use of granite is presumed to have been due to the higher cost of iron castings of comparable dimensions at the time. those items which Robbins & Lawrence would have used to manufacture parts for firearms. Most were designed, developed and manufactured by the firm itself or by neighboring companies in Windsor, including a threading machine, rifling machine, turret lathe, index milling machine and drill press. Using these tools and the gauge blocks and measuring instruments that emerged in this period, the company made some 25,000 Harpers Ferry type guns in 1846 to 1850, all with fully interchangeable parts. With triumphs like that, firms like Robbins & Lawrence soon spawned other firms, filling the Windsor area with enterprising new machine tool companies. A piece from the National Acme Mfg. Co., Cleveland, Ohio, 1911. Like today’s Silicon Valley, Precision Valley seemed to have both attracted and created innovators. Well represented in the museum collection are artifacts linked to one of the most outstanding innovators of the bunch—James Hartness, an inventor, engineer, businessman, leading amateur astronomer, aviator and politician. He began his career in Connecticut, but after an employer cut him out of revenues from one of his inventions, he headed for the hills of Vermont, where in the 1880s he revitalized established machine tool maker Jones & Lamson. His 120 patents include the design for the original flat turret lathe, which provided greater rigidity, precision and higher speeds and feeds. Hartness also developed an improved roller bar feed and die head designs. Later in life he was chairman of the National Screw-Thread Commission, which worked to create international standards for the measurement and sizing of screw threads. 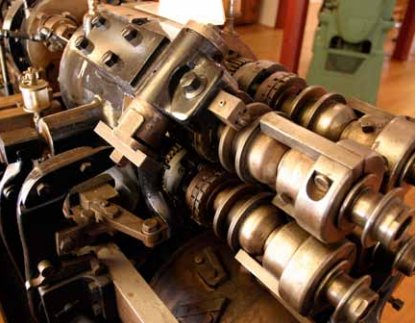 kers, which began some 80 years ago under his auspices) and resulted in the optical Hartness Screw-Thread Comparator, versions of which are on display at the museum and still common in industry. As if those accomplishments weren’t enough, Hartness also eventually rose to top management at Jones & Lamson, which he ran for many years, assisted other machine tool entrepreneurs, and even served as governor of Vermont. If you’re scouring the American Precision Museum for an example of modern machining, how about the first, serial number one, 1938 Bridgeport milling machine. It’s a gleaming neighbor to an older J&L turret lathe and defines yet another corner of the building where the Lilliputian wonders of John Aschauer, a German-born tool maker who immigrated to the U.S. and settled in Warren, Michigan, hold pride of place. In some 40,000 hours of “spare” time, he created two extensive working model miniature machine shops, with each machine reaching only inches tall. The first, a “general purpose” shop, includes four shapers, eight drill presses, a surface grinder, three lathes, a pedestal grinder, table saw, two band saws, an arbor press, and a surface plate. Not only do all of the components operate, but the tiny shop even includes miniature hand tools. Another display offers a miniaturized automobile engine production shop complete with miniature planers, vertical boring mills, drill presses, lathes, vertical and horizontal drilling machines, and the crowning achievements, a V-6 cylinder bore transfer machine and a 45-degree drilling and tapping machine. There’s plenty for visitors that’s hands-on to complement the static display cases, including a demonstration area frequently manned by interns or museum volunteers. On the day I visited I met Clay Washburn, who in addition to knowing about all kinds of machining, claims for himself the dubious distinction of being the last employee of the Cone Blanchard Machine Company, which was sold and effectively went out of business in 2002. Washburn, who arrived in the region in the early 1960s, had a variety of positions at Cone Blanchard, the last involved helping to complete the company’s largest surface grinding machine, with a 120-inch chuck, and, according to Washburn, some 12 miles of copper wire. His current “job” is less daunting, turning tiny “goblets” from brass stock for visitors so they can see a machining process in action. Not surprisingly, Washburn feels the talent still residing in the region could have sustained Cone Blanchard and other now defunct firms. He says it was the financial maneuverings of owners and investors that undercut the operation—not foreign competition or obsolescence. Museum Trustee Roald Cann agrees, in part. He watched the industry melt down from his position in charge of R&D at Bryant Grinder Corporation before its acquisition by EX-CELL-O and through its subsequent demise under later owners, Textron and Goldman Financial. However, he notes, the precision machine tool business didn’t disappear. What did disappear were the firms who were able to compete in the mass production markets. The U.S. was largest provider of machine tools in the world in 1980, but today ranks well behind Korea and Italy in the value of its production. 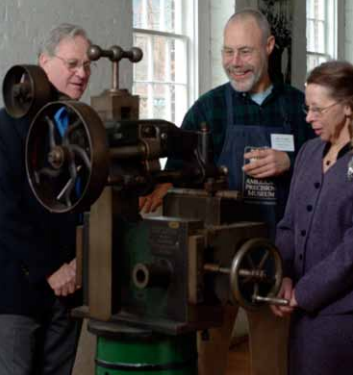 Staff John Alexander with visitors and the Gay & Silver milling machine, manufactured 1840-1850, N. Chelmsford, Mass. 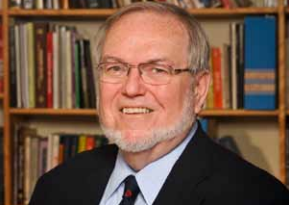 Philip B. Scranton, a historian at Rutgers University, Camden, N.J., has focused on the history of the U.S. machine tool industry since World War II. He says the collapse was the result of three primary developments. First and fore-most was the slow adoption of numerical control. Although pioneered in the U.S. (Cann notes that Bryant had the first CNC grinder on the market) American machines tended to be slow, fussy and inflexible, and did not always adopt the fastest or best electronic technology available. “Many manufacturers were satisfied to run the machines from punched paper tape,” he says. By contrast, others, particularly the Japanese, were eager adopters of CNC technology and crafted new product lines around numerical control. As more value came from ever-improving electronics, the more durable and expensive American machines, usually with fewer bells and whistles, rapidly became less competitive. “Buyers were discovering that they could afford to buy less robust machines from overseas and simply replace them every few years with newer machines that had more capabilities,” says Scranton. Another factor contributing to the U.S. problems, Scran-ton believes, was the smaller scale and family ownership patterns in much of the industry, which made them vulnerable to “conglomerates.” “These [small] companies could be relied on to produce a steady profit and when they were taken over were often milked until there was nothing left,” he says. Finally, Scranton fingers the recession “engineered by Paul Volcker’s Federal Reserve policies to stop inflation in the early 1980s.” Inflation was stopped but manufacturers, particularly the already vulnerable machine tool makers, suffered. Taking the long-term view of the Windsor region specifically, MIT historian, Smith, who also does not see the decline as inevitable, says what hurt the Connecticut River Valley the most was the government’s decision to close the Springfield Armory in the late 1960s. “It had been at the center of this community for 150 years and without it, things just fell apart,” he says. According to Merritt Roe Smith, the Leverett and William Cutten Professor of the History of Technology at MIT and author of “Harpers Ferry Armory and the New Technology,” published in 1977 and nominated for the Pulitzer Prize in History, it was the U.S. armory at Springfield, Mass., that most critically influenced the creation of modern precision machining and manufacturing in the U.S. and elsewhere. In the wake of the War of 1812, which had revealed disastrous flaws in military procurement, the Ordinance Department embarked on a quest to build on earlier experiments in France and manufacture guns using interchangeable parts. Springfield became the prime mover, not only as a place where guns were being made for the government in a government-owned factory, but as a contracting organization that developed deep linkages with industry through its force of inspectors. Those inspectors could be the bane of individual entrepreneurs but turned out to be wizards when it came to improving the whole industry. For example, says Smith, when a government inspector was sent out—say to Simeon North, who got the first private contract from the armory to build guns with interchangeable parts, they also looked around his shop and came back to tell the armory superintendents about the new machines and new tools or anything else they found there that might improve the gun making process. “Such a report was almost always followed by a letter to the particular contractor saying, we saw this machine that you have and we would like to replicate it at Springfield, please send drawings or allow us to make copies,” says Smith. In the case of Simeon North, one of the most innovative inventors of the time and the person who first conceptualized the modern milling machine, this policy meant a huge loss of potential revenue. Still, like many others, his desire to keep his government contract meant he put up with the bullying and allowed the free use of his inventions by the armory. While this situation was arguably bad for some individuals, like North, it was good for the government and ultimately good for the machine tool sector as a whole. Other companies or entrepreneurs, bearing the recommendation of a congressman or local official, could gain entrance to the armory and, in most cases, were allowed to copy designs and learn about processes at will. Thus inventions at one company were quickly replicated at other companies, and often further improved. “As a result, the armory became a clearing house,” says Smith. Companies proximate to the armory, which included the rising stars of the Precision Valley, availed themselves of these opportunities, creating a business environment not unlike today’s Silicon Valley—with ideas flowing rapidly from one company to another and new firms and spin-offs being formed at a rapid rate. “Springfield was known as the Grand National Armory for a good reason,” adds Smith. Even the Shakers—a pacific religious sect that blossomed in the 19th century—made pilgrimages to Springfield. “They wanted more time for prayer and contemplation and the innovations they learned about at Springfield helped them to improve and automate their woodworking machinery,” says Smith. Today, says Smith, the closest parallel to the American System in its impact on business is probably the open software movement, which has helped create many powerful applications and even operating systems that are now available at low cost. Another modern point of comparison is GPS, which was created by the Air Force but ended up spawning a global industry. “I know there are many Air Force people still upset that they didn’t recognize the profit potential and find a way to cash in,” says Smith. Today’s Machining World Archives November/December 2010 Volume 06 Issue 09. Great article. New England was where it started. The arsenal at Harpers Ferry made many advancements. We have an interesting history in manufacturing. Too bad everyone is willing to give it away. No one wants their kid to work in a factory…another bad assumption. The Manufaturing institute along with Deloitte announced there are 600,000 open jobs in manufacturing today. We’re still the worlds’ greatest manufacturer. Manufacturing made this country what it is. I hope we’re not too good “to get our hands dirty”. Cincinnati, Ohio was supposedly number 4 on Germany’s hit list as they were within months of producing a bomber that could fly the Atlantic. The First target was Washington DC, the second was New York City, financial center of the US, the third target was the Straits of Sault Ste Marie to keep iron ore from reaching the midwest and fourth was Cincinnati, “the machine tool capital of the world”. As a young man,I witnessed first hand the demise of great machine tool producers like LeBlond, Carlton, American, Cincinnati Shaper, Lodge and Shipley, Cincinati Mill and others of that era, ala Monarch Machine. I believe the management of those companies believed their own propaganda…we are the best and they saw no reason to change. The Yen vs the dollar also worked against us, none the less, we weren’t paying attention to the changes taking place. At a demonstration at Lodge and Shipley in the mid 1960’s, I ask if they were ever going to build an N/C machine for job shops. The fellow laughed and said,” N/C machines are for big production companies. Job shops will never use N/C”. We just didnt’ have the foresight to develop the market. Those that did, Sheldon, Leblond and South Bend tried but came up with machines that missed the mark. The rest is history.